Passwords are a big memory challenge for every person who uses the internet. Every online bank account; each online merchant account; every blog site, social media platform, etc. requires a password. Each one should be different, and every one of them should be changed frequently. Ideally, they should contain mixes of numbers, upper and lower case letters, and symbols. And they should not be easily ascertained strings like children’s names, birthdates, anniversaries, etc. It’s all very important for security reasons, but it is enough to cause sleepless nights. How to cope? Keepass is a wonderful free app that takes the weight of password issues off our shoulders. It is a portable (it doesn’t even need to be installed), savable database that is entirely encrypted to NSA top secret standards. While the app itself is completely offline, it can synch across PC and mobile platforms via Dropbox or any other synching service. 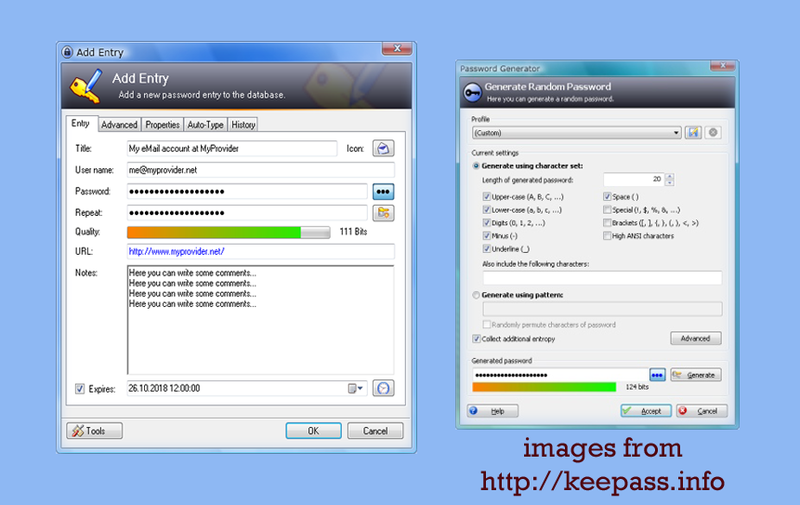 Keepass holds all URLs, user names, passwords, and notes for every one of our applications that require guarded entry. A secure master password that we develop opens a home screen where we may begin setting up our databases. We need only input each of the platforms/services we use along with our user names. We can then either input our passwords or have Keepass generate random ones based on the criteria we give it for length, character inclusions, upper and lower case, etc. We can also configure the app so our passwords expire after a specified amount of time, thereby bolstering security by ensuring frequent changes. Inputting the URL of the sites which require our passwords makes accessing them from within the Keepass application as easy as clicking the generated link. Upon clicking to our desired platforms we need only double click on our user names within KeePass. That action copies the information to our clipboards, where it remains for about 10 seconds. Within that time we need to paste those user names into the appropriate fields on our platforms. Repeat the process by double clicking on our passwords in KeePass and pasting in the appropriate boxes for passwords on our platforms. Done! 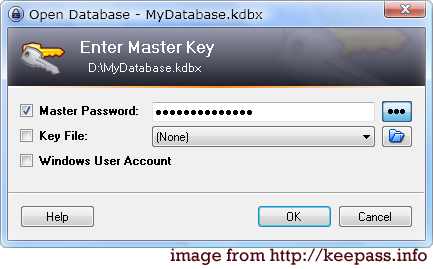 New users who would like to learn more about the application can take a look at this wonderful KeePass tutorial. It is great for easy reference while setting up our databases. Have you tried KeePass? What do you think of it? Please share your feedback in the comments section below! This entry was posted in Keepass, password management, Social Media Management/Marketing and tagged Jeanine, Keepass, password management, Social Media Management/Marketing, Vecchiarelli by Jeanine Vecchiarelli. Bookmark the permalink. Thanks for the tip! I have been hearing a lot about 1password, bt this seems like another plausible option. I appreciate you sharing your insight!